Kennel (the van) cooled his treads today at family-owned Zion RV & Campground, which is better than the National Park campgrounds, IMHO. Why? First of all try getting a spot in Zion National Park without a reservation. I tried and failed! 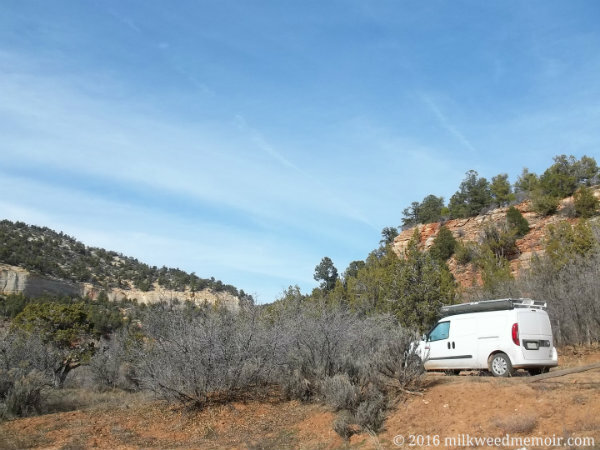 So Kennel, Coco, Tiarra, and I headed east into Utah’s Slickrock Country. But just 3 miles east of the park entrance, we found *our* Zion. It’s beautiful, quiet, and price-competitive with the National Park. The tent campsites are nestled among shrubby trees, so you don’t feel elbow-to-elbow with other campers. There are also games, WiFi, showers, and laundry. * Across the street is a trading post with curios, souvenirs, a pizza parlor, and a demonstration blacksmith shop. Best of all, there’s a whole lot fewer people on the east side of Zion National Park. The west entrance gets all the Salt Lake City and Las Vegas (and other) visitors coming off I-15. It’s an overdeveloped playground for the rich and richer. But this side of the park is kind of in the middle of nowhere – just the way I like it. If you’re coming up here to stay awhile, and especially if you have kids with you, I think the campground is a better option than the National Park. It’s less busy, there’s more for the kids to do, and you’ve got showers, which you don’t get in the National Park – all for about the same price. Zion RV & Campground is owned by the same family as Zion Mountain Ranch, a buffalo (American bison) ranch just up the street. The ranch has cabins and lodges, horseback trips into the National Park, and a restaurant that specializes in serving buffalo meat. * Note: Right now, they’re doing upgrades on the shower house. But the laundry and bathrooms work. The contractors will be done by “the season,” which I guess is end of April 2016 or so. 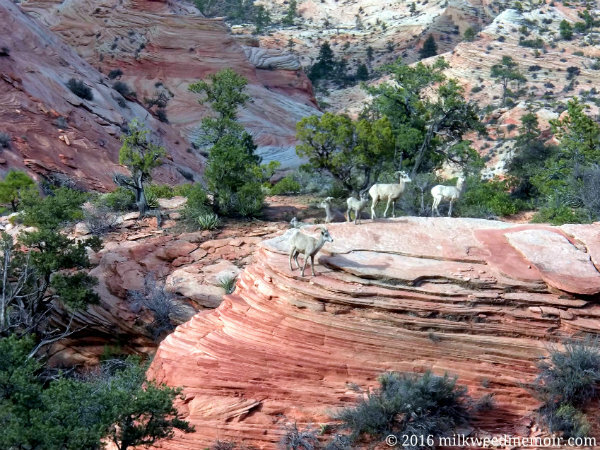 This is an actual photo – not a painting – of bighorn sheep resting on a slickrock outcrop along Zion National Park’s Mount Carmel Highway. But you can hardly be blamed for thinking otherwise. First, the magnification is zoomed up to my little Kodak’s maximum. Second, the textures, lines, and colors of the Slickrock Country on Zion’s east side are … fanciful, faerie-like. While driving through, I, myself, could hardly believe I was in a real place of this world. Perhaps Zion National Park isn’t quite of this world after all. Zion, to the Mormons (Latter Day Saints), who gave this region its English name, is a metaphorical as well as real place. It is the ancient city of Enoch, which was taken to Heaven and will return to Earth so that a temple will be built (rebuilding of Solomon’s temple?) during Jesus’ second coming. I’m probably reading too much into this. It’s fanciful to think that one can walk in a place that straddles the gateway between Heaven and Earth, between the mortal and Faerie. Yet like Kolob Canyons yesterday, I can’t help but feel I’m in the presence of a power or powers greater than myself. The Earth throbs with life, even in each grain of sand. And the Wind whispers with the Sun. There’s that purple prose coming out of me, like poison in a hot sweat! Well, you come here and see if you don’t feel the same! In Mormon theology, Kolob is where God lives. And seeing Kolob Canyons at Zion National Park, you can believe that, yes, you’re coming into His presence, His home. 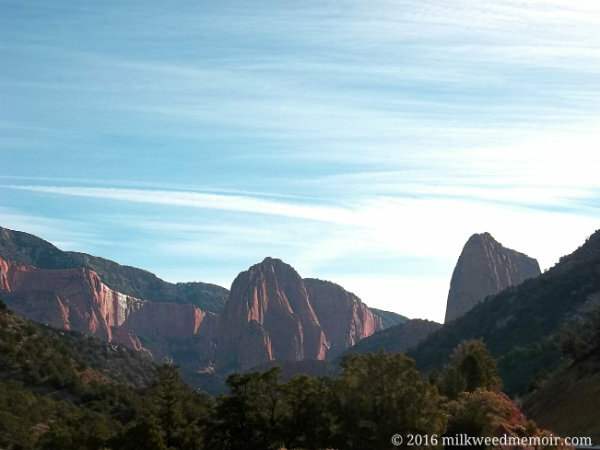 Just to clarify, though, Mormon’s don’t think God lives here in Kolob Canyons. No, to them, Kolob is a star or planet elsewhere in the universe where God and his wives live, and where we were all born as spirit children before being reborn as humans on Earth. &amp;amp;amp;amp;amp;lt;hr&amp;amp;amp;amp;amp;gt; Fun fact: Glen A. Larson, the guy who created the original “Battlestar Galactica” series, is a Mormon and informed the series with Mormon theology, it’s “Mormons in Space,” right down to naming humans’ ancient planet of origin Kobol, an anagram of Kolob! But I can understand why this place got named Kolob Canyons. You feel as if … as if you’re in the presence of something majestic and holy, as if God Himself might be standing just atop one of the mesas. The sandstone formations throughout the canyon are more uplifting, more awe-inspiring than any petty human church, mosque, or temple. This is coming from an atheist, mind you. Yet in a place like Kolob Canyons, I can’t help but feel everything around me is alive. Call it pantheistic drivel, but the very earth and air *knows* me, has personhood. Is that so crazy? Humans before me have felt this way about natural places, and some cultures have included that perspective in their religions. If this is crazy, I think it’s the good kind of crazy. I actually visited Kolob Canyons twice. On my way down to Virgin, Utah (near the Zion National Park entrance) from Parowan Gap the day before, I stopped by in the morning. But I realized later that I hadn’t left a milkweed seed ball. At camp in the evening, I knew that was an oversight that needed fixing, that Liz would have demanded I come back. So I did on this afternoon. And Kolob Canyons was no less inspiring the second day. 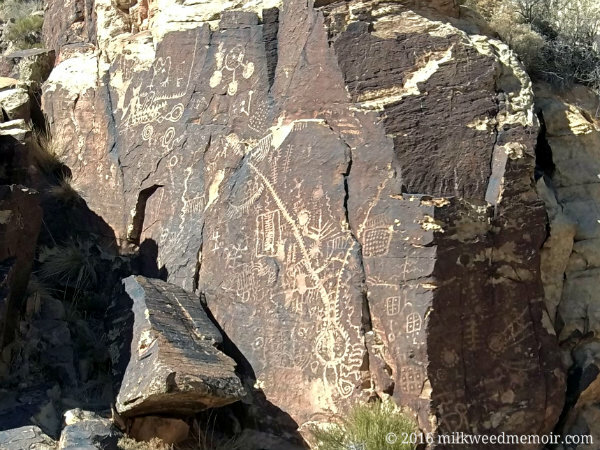 Check out these ancient Native American petroglyphs at Parowan Gap, near Parowan, Utah! No one knows who made them or what they mean, but there are hypotheses aplenty. Ute Chief Walker described Parowan Gap as “God’s Own House” to the 1849 Pratt Expedition. Indeed, Utes, Hopis, Paiutes, and other Native American peoples living Southwestern Utah in the area in the 19th century consider the place sacred and a bond to their ancestors. Yet at the same time, the petroglyphs were chiselled by more ancient cultures, possibly several, and modern Native Americans can’t translate them. But to quote an anonymous Native American, “a person doesn't work for hours and days deeply inscribing figures in solid rock just to doodle." One hypothesis interests the heck out of me. Archaeologist V. Garth Norman claims in "The Parowan Gap " that the gap and the Zipper Glyph (I think that one that looks like a roach head with giant antennas) acted as an ancient solar observatory by the Fremont culture. The gap faces west and is narrow, so I could definitely see it being used to track the sun’s latitudinal path. One thing that concerns my about Norman is that he’s "President of the Ancient America Foundation (AAF) for professional and scriptural archaeology research, and is Director of Archaeological Research Consultants (ARCON Inc.)." He also taught seminary I question whether his devotion to the Bible and the Book of Mormon outweighs his devotion to evidence. I know there’s a bunch of guys like him who’ve been proven time and again to be publishing garbage about Egyptian and Israeli “archaeology.” Mind you, that doesn’t mean he isn’t doing solid work; I’m just biased against him. But I’d like to read "The Parowan Gap " anyway and more fairly judge his work. By the way: Shout out to Freecampsites.net, where I found out about the Parowan Gap Petroglyphs. It wasn’t my favorite free campsite because of traffic, but the petroglyphs are definitely worth a look-see. Most of Great Basin National Park was closed due to winter snow, but I found this little spot by historic Lehman Creek to leave a milkweed seed ball. I think Liz would have appreciated the scenery. 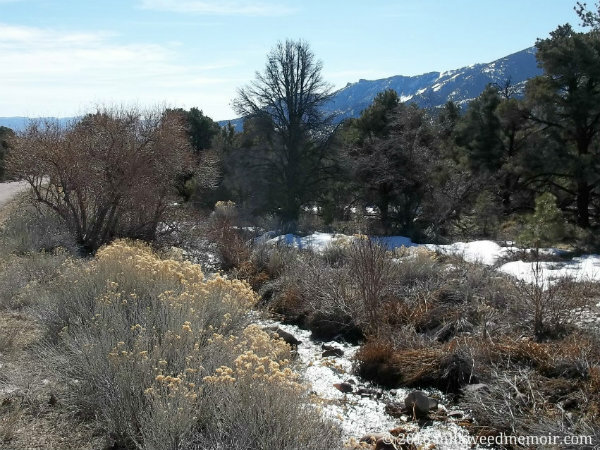 Lehman Creek is named for one of Baker, Nev., earliest American settlers, Absalom Lehman. (I say “American” settlers because Shoshone were already here, as well as the Fremont culture before them.) NPS’ Great Basin National Park subsite has a great bio about Lehman, a failed ‘49er who struck gold in Australia, then wound up a Nevada rancher. What fascinates me the most about Lehman is his orchard, which he irrigated with the creek. At its height, the orchard had hundreds of apple, peach, and other trees in a region with about 8 inches of rainfall per year. A handful of the trees still live to this day, and park visitors can sample them in season. When Liz and I visited Guadalupe Mountains National Park, in the Chihuahuan Desert, there was a historical orchard at Frijole Ranch. Like Lehman’s place, the orchard is irrigated by a creek coming out of the mountains. There, too, the orchard survives, and visitors can take a bite. In olden days, the family also produced and sold eggs and dairy. I find it intriguing – yet obvious when you think about it – that what today we’d call truck or market farms were an important part of settler economies. They couldn’t ship in Chilean grapes, now could they? Yes, wagons, mule trains, or early railroads could bring in dry goods, but if you wanted fresh eggs, dairy, vegetables, or fruit, someone had to farm them locally. Or else you’d have to do it yourself. We may get back to localizing our produce someday as petroleum becomes more scarce, unless we can find an alternative fuel to cheaply move goods long distances. 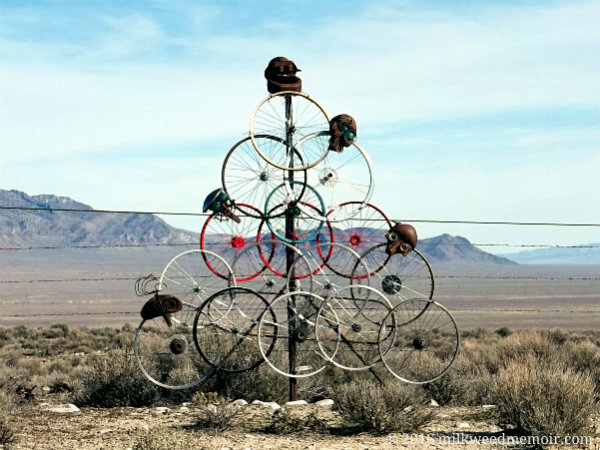 Residents of Baker, Nev. (pop. 68), like to outdo one another in “Post Impression Art,” a whimsical hobby started by the Permanent Wave Society in 1997. All around the area, locals and visitors create art installations on fence posts, pretty much just for the hell of it. My favorite was a simple pink flamingo nailed to the top of a fence post. Why? Because it’s a pink flamingo, dammit, in the middle of nowhere in the Great Basin’s sagebrush desert. The only thing better would have been a garden gnome. The flamingo wasn’t photogenic, though, so I only have memories. This Sunday, Feb. 28, was something of a catch-up day for me. I hung around the Whispering Elms Motel and Campground, finished a few blog posts, and wrote my semi-monthly letter to my list subscribers. (Sign up at top right!) Basically, other than lunch out at T&D’s grocery store/lounge/restaurant, I was chained to my laptop. No, actually, I was even chained to the laptop while eating lunch. Still, Baker is a lovely town to take a rest in, especially out of tourist season. I asked the grocer lady when folks start rolling into town to visit Great Basin National Park. Oh, forgot to mention: Baker, Nev., is the gateway to Great Basin National Park! Anyway, she said people start showing up in April, but things really kick off Memorial Day Weekend.